A Late Quartet features good performers and good dramatic intentions, but is too joyless, unpleasant, and inauthentic in its presentation and discussions of music to make any sort of impact. Yaron Zilberman’s A Late Quartet is a dreadfully joyless film about three thoroughly terrible middle-aged people, one obnoxiously chipper young woman, and Christopher Walken, excellent in the brief stretches he is given. 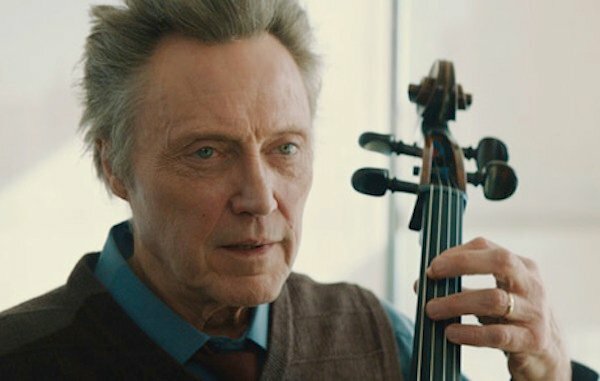 Walken plays Peter Mitchell, an elderly Cellist and anchor of a famous string quartet called “The Fugue,” who has just been diagnosed with Parkinson’s Disease. With proper medication, he may be able to play a few more shows, but his career is effectively over, and his news sends the Quartet – which has played together for 25 years – into turmoil. Walken’s material is very good, and I want to underline that point before this review becomes oppressively negative. The physical and psychological strain of his illness is handled with a deft dramatic hand, and Walken does a spectacular job illustrating how Peter comes to grips with his own mortality. His scenes are filled with pure and true emotion, authentic pathos that connect at every turn. There are some who underplay Walken’s talents as a series of odd tics and vocal patterns, but the man is so much more than that, and between this and Martin McDonagh’s Seven Psychopaths, which also featured tremendous dramatic work from the actor, I sincerely hope those criticisms can be laid to rest. He is a treasure, and when the film puts him front and center, A Late Quartet soars. The majority of the film is spent watching these three fight amongst themselves, lash out by sleeping with people they shouldn’t sleep with, going behind each other’s backs, lying, and being generally insensitive to the dying old man they each claim to care about. One wonders how they could stand each other’s company for more than five minutes, let alone play in an ensemble for 25 years. Imogen Poots also appears as Hoffman and Keener’s daughter, mainly so the filmmakers can demonstrate how completely and totally they misunderstand young people. She is a caricature wrapped in a parody, rolled up in layers of exaggeration and seasoned with heavy doses of hyperbole. The character is hilarious to watch, though not for the intended reasons. When she enters a completely undeveloped and unexplained sexual relationship with Ivanir’s character, the film moves into downright icky territory, and only gets increasingly darker and ridiculous from there. Why, I ask, can there be no joy in a film about music? 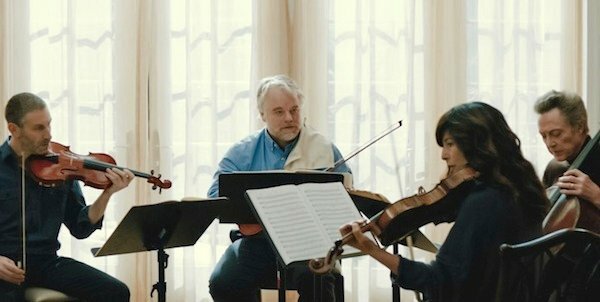 As I watched the opening scene, where the Quartet conducts a short rehearsal, I felt a brief but powerful wave of enthusiasm, for the sight of strings, bows, and stands reminded me of my high school orchestra days, when I played the Viola with others. Those were good times; even when I did not like the music or felt tired of rehearsing, there was always pleasure to be had in playing. My instrument was a comfort, for it produced music, and music is a great and powerful gift in any form, especially when performed in a group. Why can there be no such happiness in A Late Quartet? Characters hold long, pretentious conversations about the nature of music, or the strength of a quartet, but the dialogue merely dances around larger ideas without applying them in any meaningful sense, and on only a few occasions do we see these people actually make music. What is the point of shooting a film about instrumentalists if we barely see them play? Was this story filmed so they could talk about their craft, or actually exercise it? I have little interest in the former, even if it were done well. We are treated to endless speeches extolling what a tremendous, revelatory Quartet this is, but without examples that last longer than half a minute, those words are meaningless. By the time the group actually plays for a decent length of time, it is the very last scene, and the results are completely underwhelming. No larger point is made about music, and all the pleasure that comes in observing musical performance has been buried and hidden away to make room for petty infighting and meaningless argumentation. There is nothing to be gained by it, for the characters or the audience. Walken may be sublime, but he is not enough to redeem this slow, undercooked mess. One’s time would be much better spent listening to the Beethoven pieces the characters repeatedly name drop, or learning to play an instrument of one’s own. Those experiences contain actual, tangible meaning. A Late Quartet does not.